French Emblems: Emblem: Calumnia dira pestis. Slander is a terrible plague. Exuitur celsa pirus deciduam luxuriem comarum. Attalicas vertere opes, conditionemque potest superbam. Here, touched by the electrifying [lit. joy-bringing] sting of a ray, as if by a star [of ill fortune], The tall pear-tree drops its deciduous abundance of leaves [lit. hair]. No differently can the slanderer, speaking falsehoods, with viperish tooth Overthrow the riches of an Attalus and all his proud condition. Armipotens Mars genitor Romulida, te, venias, precamur. lore exsiccatae arbor fit similis. Plinius lib. 9. cap. utcunque versibus à me expressam. Spicula Achaemenidum tinxit gens aspera bello. Exuit hinc viridem crudeli saucia tabe. Not weapons of war, nor the darts which the race of the Achaemenids [i.e. Persians], fierce in war, moistened with the juice of black poison. [p.81] Soon all the decoration falls, the foliage drops, the tree puts aside its green beauty, afflicted with cruel disease. No less of a sickness is present in the deadly and plague-ridden tongue of the slanderer, for it can overthrow those whose honours are flourishing, and stripping them of all their fortune, bring them down to the lowest extremity. 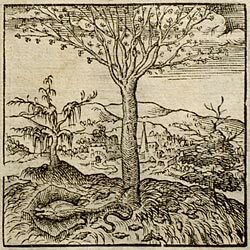 And so a pear-tree is shown flourishing, and a sting-ray is attached to its trunk which it has pierced: but in such a way that that sting, about which we have talked, can clearly be seen sticking into the trunk. * Lit. ‘a strength so lethal and of instantaneous poison’. 1. Attalus: legendarily wealthy king of Pergamum in Asia Minor (Attalicus refers to his dynasty collectively). 2. τρυγών in Greek also signifies turtle-dove. 4. A poem on fishing, by the 2nd-century Greek poet; also the title of a work by Ovid.